“Second Suns,” released June 18, 2013 is a crash course in humanity delivered as an adventurous tale. The book captures the joy of thousands of patients whose sight is restored with a 10-minute procedure, draws attention to dangerous issues within the medical community that fails us and leaves us with infectious inspiration to do more with our lives. This book is written by “Three Cups of Tea” co-author David Oliver Relin. “Second Suns” is the true-life story of two very dissimilar doctors. Serving with the same spirit. In “Second Suns,” we are introduced to Drs. Sanduk Ruit and Geoffrey Tabin who are born a world apart and brought together in brotherhood to eradicate preventable blindness that is prevalent throughout the world’s developing countries. “Second Suns” takes the reader from the remote village of Olangchungola, the birthplace of Dr. Ruit, where as a boy of 7, he and his father trekked for 15 days to deliver Ruit to the closest school. It flashes to the privileged life of an obnoxious, over indulged, Ivy Leaguer named Geoff Tabin. How these two men meet and partner in the creation of the Himalayan Cataract Project, is told by Relin in such a way that I was unable to put the book down. David Oliver Relin died in November 2012. Relin’s author’s note reads: “Some books you want to write. Others you have to write.” It is the opinion of Pop Culture Shock that “Second Suns” is one of those books that you have to read! 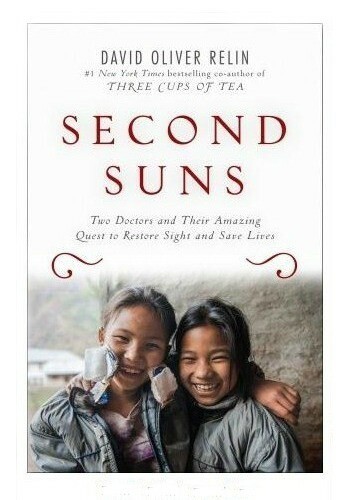 “Second Suns” ($27) is published by Random House and is available at the website. For more information about the Himalayan Cataract Project, visit CureBlindness.org.